“MamaEarth, is a brand, by a parent, for the parents.” I loved it when I heard it for the first time. That was the time when I first used their baby care products. I instantly fell in love with this brand. The brand not only just promises but really fulfils the promise of bringing 100% natural products to us. The brand makes products which are 100% toxin free for both mums and babies. I tried their baby care products and the mama range. The products are extremely gentle in nature. I never faced any kind of skin reactions or allergies. I tried their products for my kids as well as for myself. The brand has come up with new range of products as Traditional Recipes. I got a chance to try the Organic Apple Cider Vinegar for mama and Feel Better Tea. Both the products are new to me but with the trust in the brand I decided to try them. For centuries, vinegar has been known as a popular household item. It is used for various purposes. Apple cider vinegar is the most popular vinegar in this natural health community. There are various benefits of apple cider vinegar but one should be very careful in its usage since it has side effects too. For using it, the directions of usage must be strictly followed. 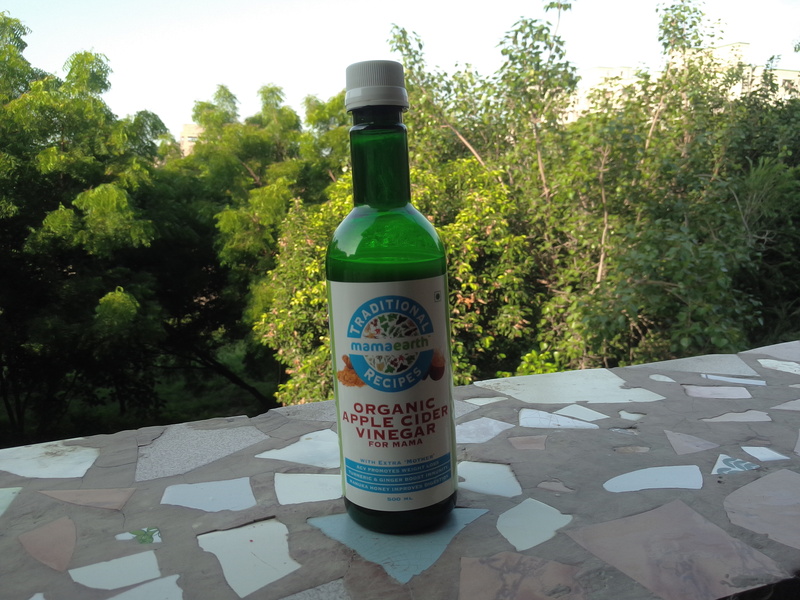 The apple cider vinegar by MamaEarth is prepared from organic Himalayan apples with the goodness of raw enzymes. It has Manuka honey, which is one of the most unique and beneficial honey. The other ingredients included in it are ginger and turmeric. It is always advisable to shake the bottle first before using it. As per the given directions, 10ml of MamaEarth ACV should be diluted in 250 ml of water. It should be taken half an hour before breakfast. Consuming ACV before having breakfast in the morning aids weight loss. ACV makes you feel fuller which means you might like to eat less after having it in the morning. Also, its acidic nature stops you from absorbing the calories from the carbs in your diet. It makes a great natural skin toner which can act as a home remedy to get rid of acne. It leaves the skin look healthier and keeps acne under control. ACV can help kill bacteria that causes bad breath in the mouth. It also helps in removing stains from teeth and makes them white. Rub your teeth with ACV and rinse it with water. Drinking ACV diluted in water helps in the overall detoxification of the body. After shampooing your hair, rinse them with ACV solution. It will boost your hair’s body and make them shine. For this mix 10ml of ACV in 250 ml of water. MamaEarth Apple cider vinegar comes in 500 ml bottle. The ingredients, directions for use and nutritional information are clearly given. It is priced at 599 INR. Since it has to be used in moderation and after diluting in water, it makes it pocket friendly. 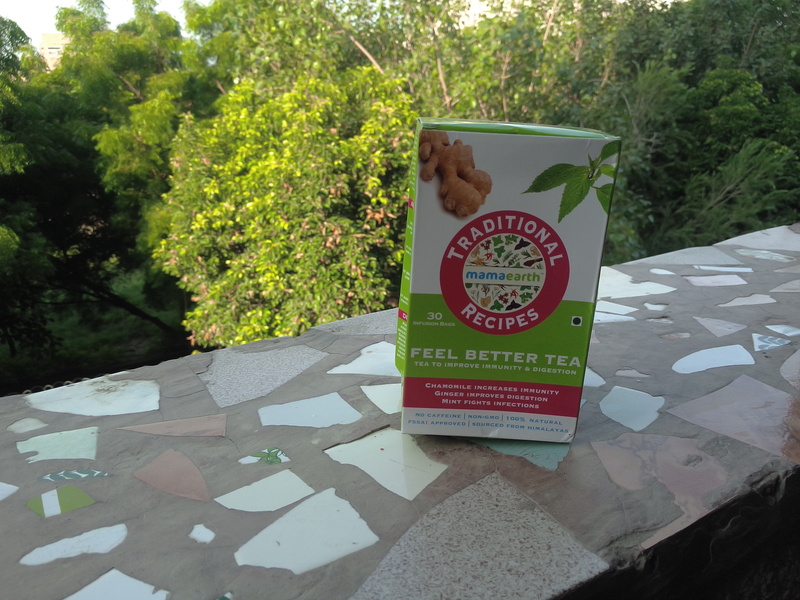 The second product which I got to try is the Feel Better Tea. It’s not easy to become a mom. Acidity and low immunity makes motherhood more difficult. Feel Better Tea helps strengthen immunity and boosts stomach. Feel Better Tea has some of the most awesome herbs in it. Its key ingredients are Nettle leaf, chamomile, mint and ginger. The product must be used as per the given instructions. To prepare this herb tea, boil 200ml of water. Pour the boiled water onto a tea bag in a ceramic cup. Keep it covered for 10-15 minutes. Drink this tea daily between the meals to feel the benefits. The presence of Nettle in it helps purify blood and cures stomach upset. It is helpful for acne and skin eczema. Chamomile helps in calming the nervous system. It builds immunity and aids in digestion. It relaxes mind and promotes good sleep. Mint is known to boost immune system especially against cold and cough. It also helps reduce menstrual cramping. Ginger, as its one of the key ingredients, aids in digestion, reducing nausea and helps manage the imbalances in the gut and builds immunity. A box of Feel Better Tea comes with 30 infusion bags. It is priced at 599 INR. After using it myself and feeling the benefits of it, I find it completely worth its price. I used both the products for a week. Apple cider vinegar has sour taste but is okay when diluted in water. While its benefit for weight loss can be noticed only after 2-3 weeks, other benefits like whitening teeth and controlling bad breath and as a hair conditioner can be immediately seen. I felt instantly refreshed after having Feel Better Tea. In this change of weather, it is really a very helpful product to fight off cold and coughs. MamaEarth products are available on Amazon. You can also buy them from their official site. The new products from Mamaearth looks really great. I would love to explore this new range. As always both the products looks promising. I liked the line it’s by a parent for a parent. I need to start consuming apple cider vinegar before breakfast for weight loss.I really need to lose some weight. I was planning to try the feel better tea for a while now. Your article gave me all the right reasons now. Thanks. I would love to try these products. Your review is encouraging enough.